Mikko Hirvonen will be helped through the withdrawals of his post-WRC career by competing for the all conquering MINI X-raid Team in the 2016 Dakar Rally (3–16 January). 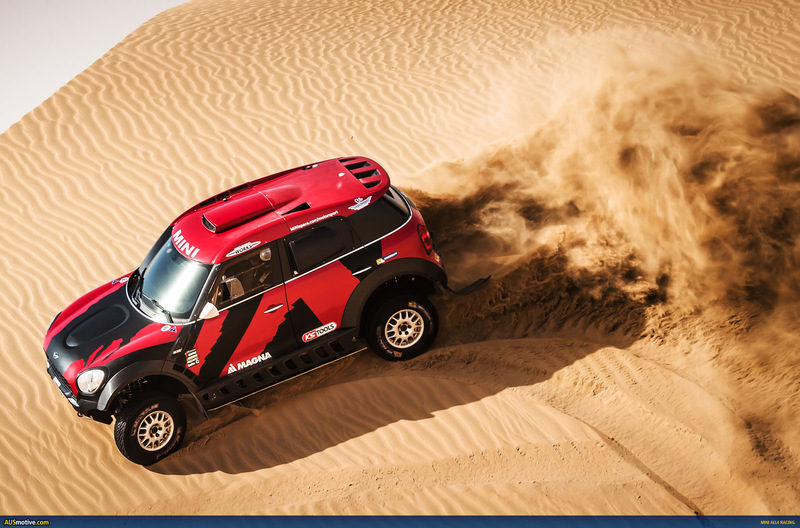 The MINI All4 Racing has won the last four Dakar events. What does Mikko know about the Dakar? Not a lot it turns out, which is why he will be preparing for the Dakar by competing with X-raid in a selection of events in the FIA Cross Country Rally World Cup. Mikko will make his MINI All4 Racing debut in the Baja Aragón race (24–26 July). Even though he is joining a team with hopes of outright success at Dakar, Hirvonen maintains the old adage to finish first, first you have to finish. 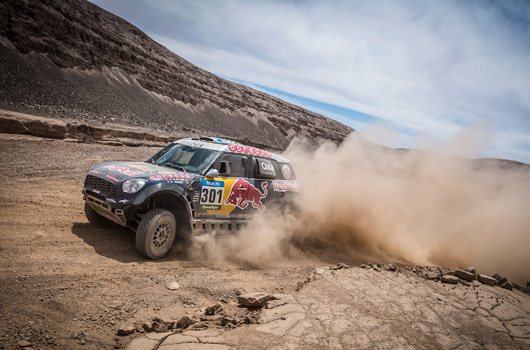 “Dakar is such a long race and the dunes there are in a world of their own,” Hirvonen said. “So, to finish the event without encountering major issues or without getting stuck anywhere already would represent a really good achievement for my first Dakar. “Meanwhile, the Baja Aragón is going to be more of the kind of rallying I’m used to. But driving without pace notes in your road book is not so easy and I still have to familiarise myself with the MINI All4 Racing as well. 14 July 2015, Munich (DE). MINI and X-raid are pleased to announce Mikko Hirvonen (FI), former WRC specialist and hero to WRC fans world-wide, is to compete for the Dakar Rally 2016 title in a MINI ALL4 Racing. Hirvonen’s time leading up to this prestigious event (3-13 January 2016) will be spent getting acquainted with his MINI ALL4 Racing in racing conditions by competing in selected rounds of the 2015 FIA Cross Country Rally World Cup, starting with Spain’s Baja Aragón, 24-26 July 2015. Mikko Hirvonen, 34, is an accomplished rally driver from Finland with four second-placed finishes (2008, 2009, 2011, and 2012) to his name in the fast-paced World Rally Championship. His list of early age accomplishments at rallying quickly earned him the right to be tagged as “Flying Finn”, an accolade used to describe the efforts of fellow Finns in various sporting arenas. Hirvonen will be joined at the flight deck of his MINI ALL4 Racing by experienced co-driver Michel Périn (FR). Périn is a four-time Dakar winner and celebrated his last Dakar Rally win in 2014 when he partnered Nani Roma in a MINI ALL4 Racing. MINI and the MINI ALL4 Racing has now won the Dakar Rally an enviable four times, the latest and consecutive win came in January this year. Followers of the FIA Cross Country Rally World Cup will be surprised to see Périn back in the thick of rally action after the Frenchman retired from the sport earlier this year. Hirvonen also retired from WRC in 2014, but the lure of competing in the Dakar Rally – the greatest rally endurance event – and the FIA Cross Country Rally World Cup at the controls of a MINI ALL4 racing was enough to tempt Hirvonen to test drive a MINI ALL4 Racing. This new dynamic duo of Mikko Hirvonen and Michel Périn came to be when the pair teamed up for the test sessions in Morocco earlier this year and immediately hit it off. Talking about his leap onto the stage of the FIA Cross Country Rally World Cup, Hirvonen said: “Dakar is such a long race and the dunes there are in a world of their own. So, to finish the event without encountering major issues or without getting stuck anywhere already would represent a really good achievement for my first Dakar. Race calendar: 2015 FIA World Cup for Cross Country Rallies. There are currently no comments for this post. Why not be the first?